Tony is just full of interesting tweets today! 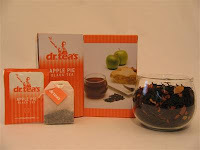 After a hard rehearsal with Kate on Sunday night, he tweeted that he enjoyed some "apple pie" tea from Dr. Tea's, a West Hollywood-based herbal tea company. Is this another freebie for Kate or is this a perk of being on DWTS? I wonder what the kids got. I think this company gives celebs free tea in the hopes they'll mention it, like Tony did. I worked for a celeb it's astounding the amount of free stuff they get. It's such irony you work so hard to get rich then once you're rich you don't even need the money anymore since everything is free! All the tea in China wouldn't be reward enough for trying to teach Kate to dance. They should give the man a year's supply of Valium to go with it. By the time this is over he'll need it! I'm just guessing, but I would bet that Tony is being paid extra to be Kate's partner. Oh, he's certainly being paid extra, it's in his contract!